I’m a black American, I am proud of my race. I am proud of who I am. I have a lot of pride and dignity. February 23 – Baseball catcher Elston Gene Howard was born in St. Louis, Missouri. In 1965, Howard signed a $70,000 contract with the NY Yankees and became the highest paid player in the history of baseball at the time in 1929. February 24 – Former world heavyweight boxing champion Jimmy Ellis was born James Albert Ellis in Louisville, Kentucky in 1940. Ellis won the World Boxing Association title after beating Jerry Quarry in April 1968. February 25 – Muhammad Ali defeated Sonny Liston for world heavyweight boxing championship in 1964. Boxer Mike Tyson becomes the undisputed Heavyweight Champion of the World by defeating challenger Frank Bruno of England in 1989. February 26 – Theodore “Georgia Deacon” Flowers wins middleweight boxing title in 1926. On this day in 1964., the Kentucky boxer known to all as Cassius Clay, changed his name to Cassius X as he accepted Islam and rejected Christianity. “I believe in the religion of Islam. I believe in Allah and in peace…I’m not a Christian anymore.” According to two biographies, Muhammad Ali by Anthony O. Edmonds and My View from the Corner by Angelo Dundee, Cassius Clay changed his name to Cassius X on the 26th. Elijah Muhammed, a black Muslim leader, announced Cassius X’s name was being changed to Muhammad Ali. February 27 – Figure skater Debi Thomas becomes the first African American to win a medal (bronze) at the winter Olympic Games in 1988. February 28 – In 1932, Richard Spikes invents the automatic gear shift. Also Musician and entertainer Michael Jackson wins eight Grammy Awards. His album, Thriller, broke all sales records to-date, and remains one of the top-grossing albums of all time. 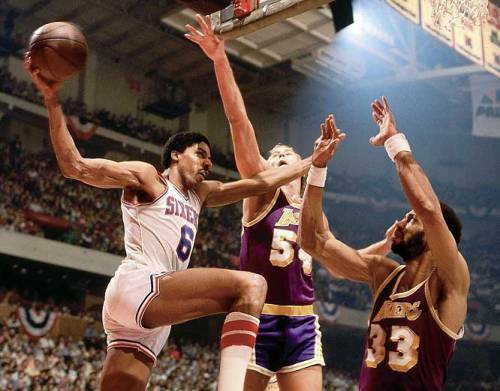 Dr. J. makes a house call.